Sweden, Belgium and Italy all in that order, will have to be very careful and not underestimate Republic of Ireland side that arrives in France this week for the European Championship Finals. If you are to believe all the fans who are going to the finals, they would have you believe anyone can win this tournament. The confidence in the squad at the moment is sky high and all the players are raring to go. Assistant manager Roy Keane believes the squad can go a long way in the finals and if Leicester can win win the Premiership, why can’t Ireland do the same as Greece did in the European Championships in 2004 and actually win the whole thing. The last time an Irish team went to the Finals was 2012 and with the overhype from certain sections of the media that we could have a great tournament, ended in bitter disappointment and the players came home a sad bunch. This time in my opinion the Irish team should be travelling with cautious optimism, and as a squad they are better organised than in 2012. Manager Martin O’Neill and his coaching staff have put a self belief into his squad that they can beat anyone. To prove this point, all you have to do is look at the results against World Champions Germany in qualifying, a draw and a win that effectively helped his team qualify. Martin has watched his side play four friendlies in the past couple of months and now finally he has put his 23 man list for the Finals into UEFA. One player who will not be on the plane is Bournemouth’s Harry Arter who picked up an injury and had to return to his club. A sad blow for both the player and the squad, as in my opinion Harry was the man of the match in the recent game against Holland and was a certain pick for me to get on the plane, alas his time will come again. So exactly who has O’Neill picked to represent Ireland in the Finals? These twenty three names may not all be superstars, but in a group they will be extremely hard to beat. Ireland’s first match is against Sweden and it is vitally important they avoid defeat. I feel Martin O’Neills side have a strong chance to get something from the Swedish game as they themselves only qualified through the play offs and are quite a bit overhyped. Their star player is Zlatan Ibrahimovic, but I feel Ireland have enough as a defensive unit to keep him quite. This I believe will be the tatic to give the boys in green a chance to start with victory, stop Zlatan and you stop the Swedes. It is a big concern to me as to where the goals will come from for Ireland and set pieces will be vital. I expect Robbie Brady to be in the starting line up and his deliveries from corner and kick free kicks will be vital for the Irish. If Ireland can get off to a good start, you never know where it will all end up. I am not convinced about all the talk about Belgium as they have done nothing yet as a squad and they themselves were dealt a big blow on the eve of the tournament, with the loss of Vincent Kompany. Ireland,s third game will all the depend on the outcome of the opening two games and if Ireland are on a roll the Italians better thread carefully. Having got Ireland to these Finals Martin O’Neill was very reluctant to talk about a new contract and wanted to leave any discussions until after the tournament. But news broke yesterday that himself and his whole coaching staff have agreed a deal that will take them to the 2018 World Cup. It is a great piece of news that came out of the squads base in Fota Island and only adds to the feel good factor around the group. It will also kill off any speculation during the finals if any managerial posts become available during the finals, as over the past couple of months once a vacancy somewhere has arisen Roy Keane has been linked with it, this can lead to a sideshow at all press conferences and briefings during the tournament. 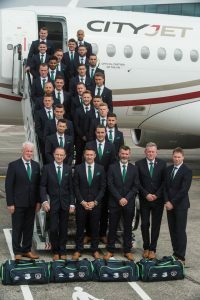 So well done to the FAI for getting a deal in place before anybody boards the plane for France. So with only a few days left to the Sweden game, Europe Beware, the Irish are heading to France on business and underestimate Martin O’Neills green and white army at your peril.